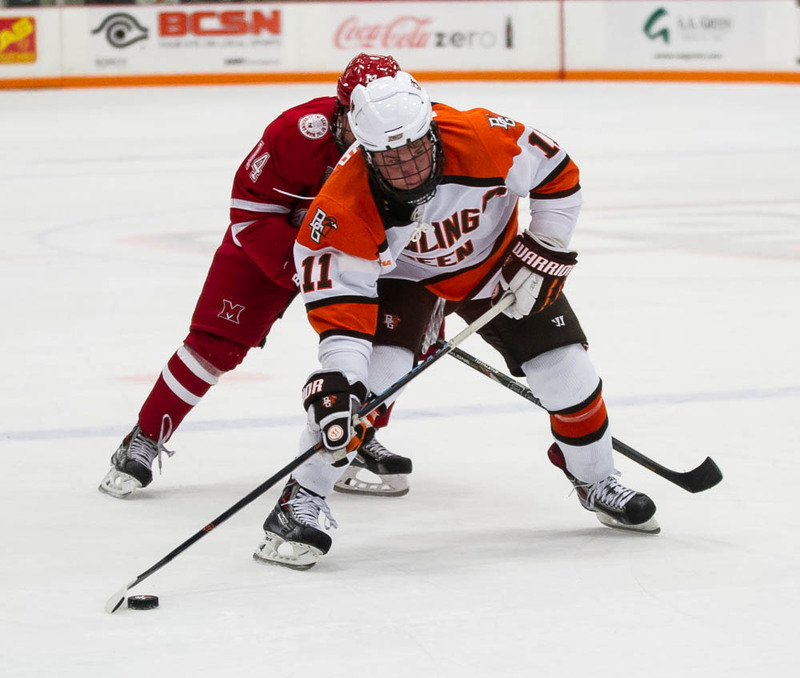 Dan DeSalvo is expected to return to Bowling Green’s lineup this weekend. The senior forward and captain missed last Saturday’s game at Clarkson with an ankle injury suffered in the series opener the previous night. DeSalvo skated Tuesday and Wednesday in practice, and should play Friday and Saturday when the Falcons host 12th-ranked Minnesota State. Faceoff is 7:07 both nights. MSU, 4-2 overall and 2-0 in the Western Collegiate Hockey Association, was the coaches pick to win the league championship. DeSalvo has 26 goals and 57 assists in 110 career games, although he has just one assist in five games this season. Before practicing this week, DeSalvo had a second exam on his ankle Monday to confirm it wasn’t fractured. INJURIES II: Bergeron said junior forward and assistant captain Brent Tate won’t play this weekend because of a groin injury. Tate, one of BG’s most valuable players, missed three games with the injury before playing Friday at Clarkson. He then sat out the series finale and hasn’t practiced this week. Also for the Falcons, Connor Kucera (shoulder) remains out. He has missed three games in a row and is expected to be out at least a total of 4-6 weeks. WELCOME BACK: The MSU series marks BG’s first home game since Oct. 10 when it posted a 3-2 win over 10th-ranked Miami. The series also is BG’s first this season with school in session. The Miami game was played during fall break. REVIEW: The Falcons are 4-1-1 overall and 2-0 in the WCHA, including a 3-0-1 mark the last two weekends on the road against WCHA rival Alabama-Huntsville and nonleague opponent Clarkson. “What I like is we’ve gone on the road, two pretty long trips, and we’ve played well,” Bergeron said. The Falcons are tied for 12th nationally in scoring (3.5 goals per game) and tied for eighth in goalsd allowed (2.0 gpg). PP/PK: The Falcon special teams continue to perform well. The power play was 1-of-4 against Clarkson, and is fifth nationally at 29.6 percent (8-of-29). The penalty killing was 5-of-6 against Clarkson, and is ninth nationally at 90.5 percent (19-of-21). BG is tied for 12th nationally in the fewest penalty minutes per game (10.0 mpg). MSU‘s power play is third in the league at 20.6 percent (7-of-34) and its penalty killing is sixth in the league at 83.9 percent (26-of-31). The Mavericks average 14.8 penalty minutes per game. GOALIES: Bergeron said sophomore Tomas Sholl will start Friday’s game in goal, but BG’s plans for Saturday are undecided. Sholl, junior Tommy Burke and freshman Chris Nell each have started two of the first six games. Sholl did not make the trip to Clarkson. Burke and Nell started that series. Sholl has a 1.50 goals-against average and a .932 save percentage. Nell has a 2.00 goals-against and a .926 save percentage. Burke has a 2.42 goals-against and a .911 save percentage.